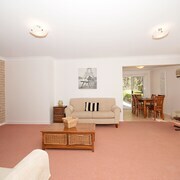 Situated in Fingal Bay, this vacation home is steps from Myall Lakes National Park and Tomaree National Park. West Nelson Bay is 3.1 mi (4.9 km) away. 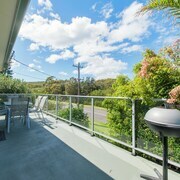 Situated in Fingal Bay, this vacation home is steps from Myall Lakes National Park and Tomaree National Park. Samurai Beach is 3.1 mi (4.9 km) away. 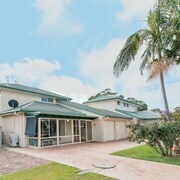 Situated in Fingal Bay, this vacation home is steps from Myall Lakes National Park and Tomaree National Park. West Nelson Bay is 2.9 mi (4.7 km) away. Fingal Bay is a short drive from Nelson Bay and Shoal Bay. 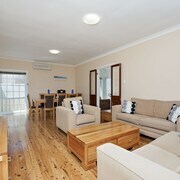 We loved our stay at Fingal bay. 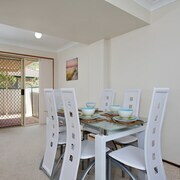 Everything is close by with restaurants within a 10 minute drive of Fingal Bay. Easy drive or cycle to other parts around Nelson Bay, and we had great views of the whales from Boat Harbour and Fingle Bay. Great location. Clean and tidy grounds. Pool is fantastic. Lots of wildlife seen in the gardens. Will definitely return again. 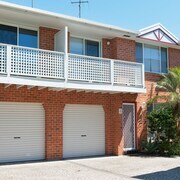 Property was close enough to walk to the beach, beautiful views and close for cafe breakfast and coffee. Wonderful location will stay here again. Which hotels are closest to the Fingal Bay airport? 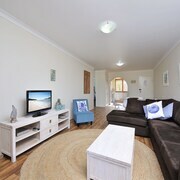 Where to stay near top Fingal Bay attractions? What kind of hotels are in Fingal Bay? Which hotel chains are in Fingal Bay? 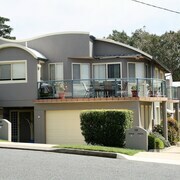 Visitors can enjoy all that Fingal Bay has to offer including the parks, monuments, and beaches. This city also attracts tourists with its relaxing and welcoming setting. Favorite places to visit in the city include Tomaree National Park, Point Stephens Lighthouse, and Myall Lakes National Park. 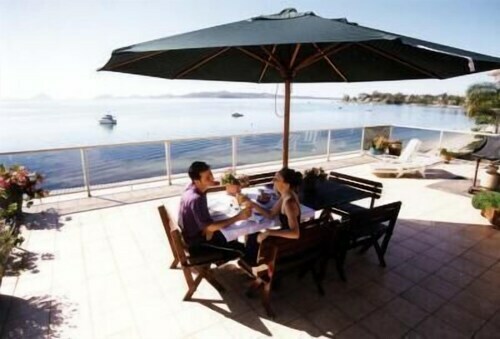 You'll also find Nelson Bay Golf Club and Samurai Beach in the area. 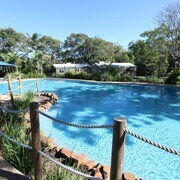 Fingal Bay Holiday Park - This 3.5-star campground features an outdoor pool, free parking, and conference space. 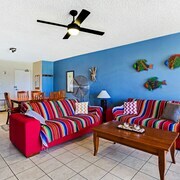 It's a favorite with Expedia travelers for its family-friendly amenities and beach locale. 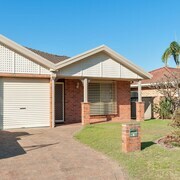 Hidden on the far eastern end of Peninsula Nelson Bay, 65 km north of Newcastle and 215 km north of Sydney, sits the Port Stephens suburb of Fingal Bay. With slightly more than 1,500 year-round residents, this township is surrounding by Tomaree National Park on all but its eastern side, where the town’s namesake body of water invites visitors to lay on the sand or catch some waves. Another popular attraction is the local lighthouse, which has a history dating back more than 150 years. Now you can explore everything this enchanting area has to offer by booking a room in any of the wonderful Fingal Bay hotels. 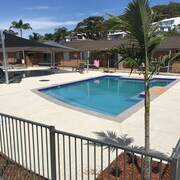 Because of this town’s relatively small size, there are only a handful of places to stay here such as Fingal Bay Holiday Park. 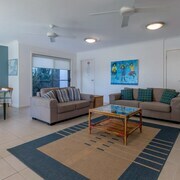 Still, you can expect to find different levels of amenities at the few Fingal Bay resorts. And no matter where you choose to rest your head, you’ll be within a minute or two walk from the water. 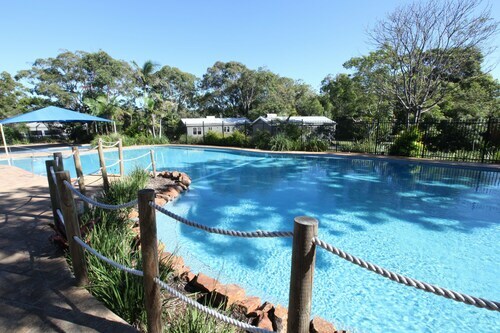 Newcastle Airport is the nearest flight facility to Fingal Bay, located just 50 km away. If your travel plans have you arriving here, you can easily arrange a car hire into town, or catch a cab if that’s more convenient. 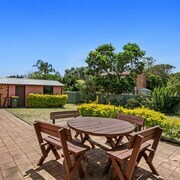 Another option is to take a bus from the airport to Newcastle Station, and from there you can grab a seat aboard one of the trains that depart for the Port Stephens area daily. Why wait another minute to start enjoying a holiday in this incredible area? 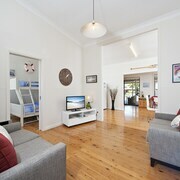 Let Expedia.com.au help you find the internet’s best deals on accommodation in Fingal Bay. 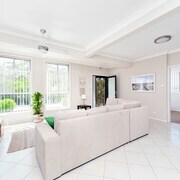 We even have great rates on Sydney flights and Nelson Bay hotels if you want to see more of NSW. 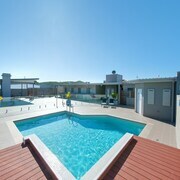 Begin your search today, and you could be on the bay before you know it! 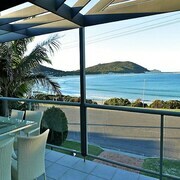 What are the most popular hotels in Fingal Bay? 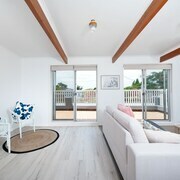 Are there hotels in cities near Fingal Bay? 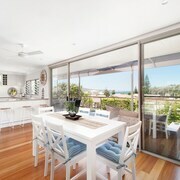 Explore Fingal Bay with Expedia.com.au’s Travel Guides to find the best flights, cars, holiday packages and more!